Forget leprechauns. The Irish have giants, as well. Stretching across the Irish Sea sits over 40,000 black basalt columns. Some of the columns are more than 35 feet tall. The black columns formed 60 million years ago when volcanic lava cooled quickly in the cold ocean. The columns look a bit like a giant rock path or bridge across the water. Legend has it that Fionn MacCumhaill, a mythical warrior, formed the columns with his bare hands, so his armies could cross the sea to fight the Scottish. 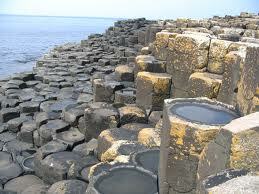 Stretching across the Irish Sea sits over 40,000 black basalt columns. Know more all about the Giant’s Causeway and read on. The columns are hexagonal and lock together. One version of the story says that Fionn was a giant, challenged by a Scottish giant, Benandonner to a fight. Fionn’s wife disguised him as a baby in a cradle. When Benandonner saw the big baby, he thought the baby’s father must be huge to have such a big baby. He ran away. Another version of the story says that Fionn was not a giant, but a hero with mythical strength. The columns start at the cliffs and disappear into the sea. Some of the columns are more than 35 feet tall. Giant’s Causeway is a World Heritage site, visited by thousands of tourists every year. A video documentary all about the Giant’s Causeway. Question: Can you visit Giant’s Causeway? Answer: Giant’s Causeway is a World Heritage site, visited by thousands of tourists every year. 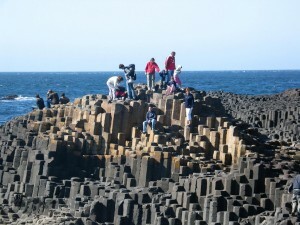 Enjoyed the Easy Science for Kids Website all about Giant’s Causeway info? Take the FREE & fun Giant’s Causeway quiz and download FREE Giant’s Causeway worksheet for kids. For lengthy info click here. Declan, Tobin. " Giant's Causeway Facts for Kids ." Easy Science for Kids, Apr 2019. Web. 26 Apr 2019. 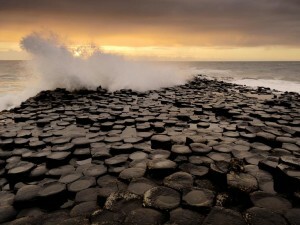 < https://easyscienceforkids.com/all-about-giants-causeway/ >. What is a Fire Rainbow?